This blog has been designed, re-designed, tweaked, overhauled, and upgraded many times in its almost four year history. This will likely never change. 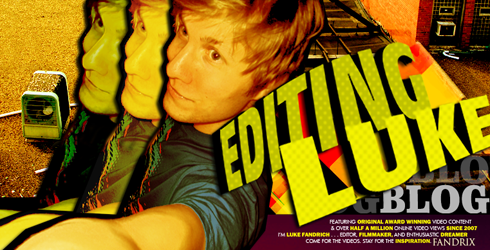 I first documented some of the original banners from 2007-2009 in an earlier post, and the reason why I put so much energy into how Editing Luke looks hasn't changed since then. Keeping an online journal is, for me, about growth, creativity, and change. I've always felt inspired to rethink my presentation and to keep myself interested in it by not letting my site ever look too familiar. Most banners only ever last a few months before they're changed or updated. Sometimes the changes are minimal, sometimes they're more dramatic, but in general I think my banners have become a trademark of my blog and capture a slice of my visual style. Starting this year I began rethinking my Editing Luke logo, and have since incorporated it into the background graffiti of my latest blog header. I've also been using the current image of myself since 2010 and I think I'll probably update that at some point this year. That could radically change the entire layout of the banner, but then again I can't predict where the design will go. I'm always trying to refine an earlier idea with a new bit of inspiration it would seem. As everything is on this site - it's a work in progress.